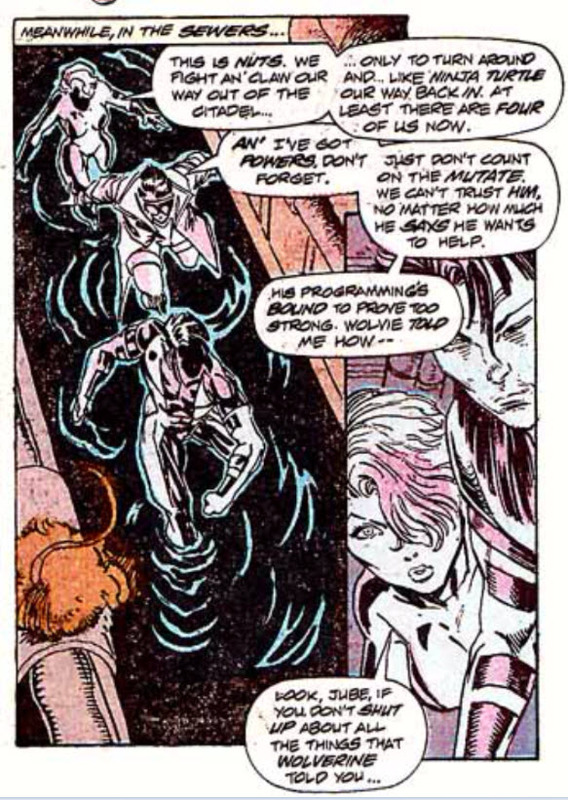 Rahne becomes a Mutate while a contingent of the X-teams get captured. Jubilee, Boom-Boom & Rictor are attacked by a pair of Magistrates using a Mutate tracker, but they overpower the soldiers, prompting the Mutate to join them. Meanwhile, at an abandoned warehouse, Cable and the rest of X-Factor and the X-Men prepare their assault on the Citadel, with the members whose powers are "quiet" planting explosive charges and locating the prisoners while the rest act as shock troops. At the Citadel, Hodge orders the Genegineer to begin the Mutate transformation process on Rahne. Later that night, Boom-Boom, Rictor & Jubilee break into an empty apartment looking for food. But when they overhear a news broadcast of Rahne claiming she's willing to serve Genosha as punishment for her crimes, Rictor insists on returning to the Citadel to rescue her. Jubilee agrees, not wanting the same thing to happen to Wolverine, while the Mutate they rescued agrees to help as much as his programming will allow. Meanwhile, the stealth force arrives at the Citadel, but are soon discovered, prompting a battle with Magistrates just as Boom-Boom, Rictor & Jubilee arrive. They watch from afar as Hodge and Wipeout intervene, capturing most of their teammates. Hodge overhears them, but their Mutate ally covers for them. Just then, Hodge calls forth Mutate #490 to taunt his captives, and Rahne emerges from the shadows, declaring they'll be tried and turned into Mutates as well, to serve Genosha as she now does. Rictor vows to find Wipeout and get his powers back, after which the Genoshans will return Rahne and his friends to him, or else he'll shake the island so hard no a single building will remain. On the heels of Storm's transformation into a Mutate in X-Men #271, this issue finds Rahne undergoing the same process as well. Unlike Storm, Rahne's transformation will have a far more lasting effect her - while she won't remain a Mutate much longer than storm, the ramifications of this event will remain a part of her character throughout the end of New Mutants, through her tenure in X-Factor and into her time in Excalibur, and thus, for most of the next decades' worth of issues, making this the final appearance of the traditional Rahne as presented in the series thus far for a long time. By the end of the issue, Marvel Girl, Cable, Sunspot, Gambit and Forge are captured by Hodge after Wipeout removes their powers. Cannonball is, laughably, shown in the background of one of the panels as being a member of the stealth team as well, which is probably a case of Liefeld just drawing what he wanted, and I don't believe Cannonball is shown amongst the captives in the next chapter. 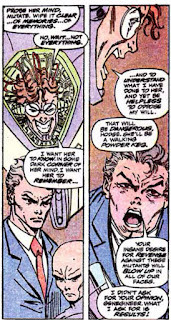 Boom-Boom, somewhat rightly, complains that her power and Jubilee's are essentially the same. Later, Boom-Boom (who's snarkily delightful in this issue, honestly) tells Jubilee to shut up already about how awesome Wolverine and how Jubilee is totally his best friend. Both she and Rictor stress throughout this issue how despite being powerless, they're not helpless, thanks to Cable's training. In prepping Rahne for the mutate process, Hodge insists that the Genegineer program her such that some part of her mind recalls her previous life and is aware of her status as a mindless slave. Boom-Boom is able to leap from a standing position high enough into the air to kick up at a Magistrate on her way down. Also, Boom-Boom presumably has no depth perception in this issue, as she spends most of it with half her face covered by her hair (a favorite trick of Liefeld's). Rictor professes his love for Rahne in this issue. After teaming up with an unnamed artistic crew last issue and with a fill-in on tap for next issue, this is the only chapter of "X-Tinction Agenda" that Rob Liefeld draws on his own. Even then, he still needs two inkers on this issue, and the transition between them is not exactly subtle (if I had to guess, I'd say that the crisper art more akin to Liefeld's usual fare was done by Thibert, with Rubinstein handling the pages with the thicker lines, but I'm also terrible at recognizing this stuff). To Liefeld's credit, the art here is a step up from the previous issue, in that it suffers from fewer incomprehensible panel transitions and the captions/dialogue don't have to work quite as hard to cover for the art by explaining what readers are supposed to be seeing. It's still Liefeld art though, so it isn't exactly good, but it at least carries the same charms, so to speak, as the rest of his work on the series. Tomorrow, the X-Teams counterattack in X-Factor #61. Next week, Thor #427-429 and Excalibur #32. This is another of those issues wherein Weezie's repetitive writing style really cloys at me. You've pointed it out: The three or four times that they go around on the loop of "But you don't have powers!" "We don't need powers!" "But you don't have powers!" "Who needs powers?" "But you don't even have powers!" "Just because we don't have powers doesn't make us helpless!" For me, this is a little less cloying, since it's at least tied to characterization. But it definitely is a bit much. "the ramifications of this event will remain a part of her character throughout the end of New Mutants, through her tenure in X-Factor and into her time in Excalibur"
No. 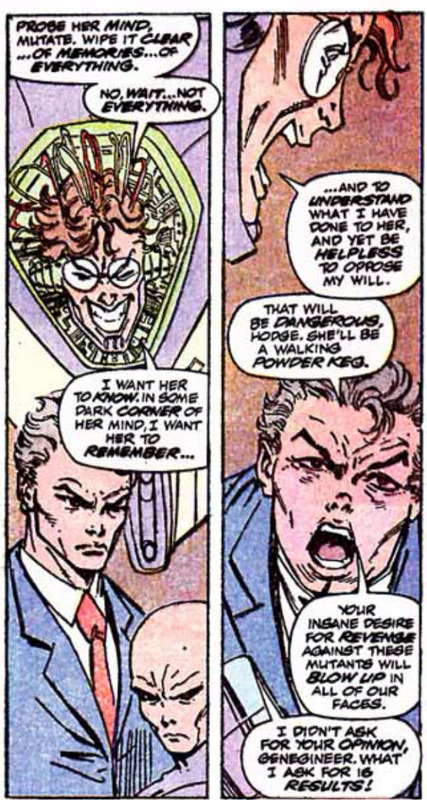 She gets cured in X-factor (circa issue #99 of that series), before she joins Excaliber. The Liefeld art again drags this story down. It is a step up from the previous issue, but only marginally. And isn't Rictor's mutate uniform miscolored in this issue? "Cannonball is, laughably, shown in the background of one of the panels as being a member of the stealth team as well"
Its interesting that the Beast is also featured so prominently on the cover when too isn't a part of the assault team. 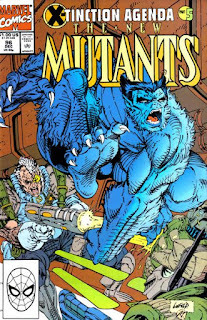 But hey, Liefeld probably figured he wanted to draw the Beast, so, ok.
Yeah, I just meant that even in that series, she's still dealing with the fallout of her post-Mutate condition. 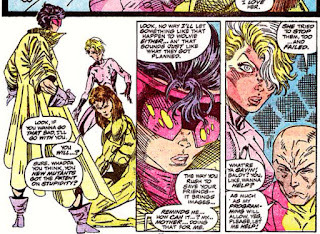 But I suppose before too long in Excalibur she becomes more concerned with Moira having the Legacy Virus. 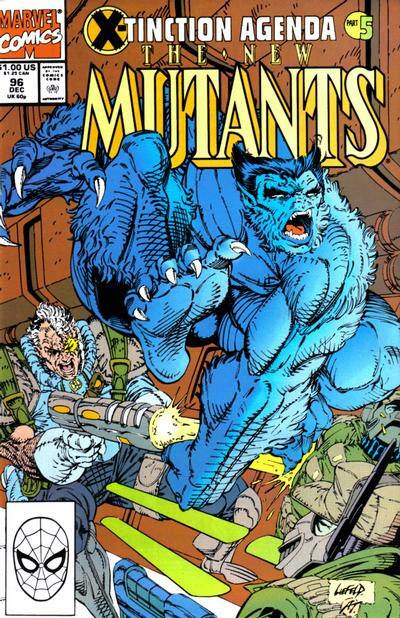 But hey, Liefeld probably figured he wanted to draw the Beast, so, ok. I believe Liefeld has said in interviews that he is a big Beast fan. I know he draws a Beast solo story for Marvel Comics Presents in the near future (which we'll look at eventually). It takes a brave guy who can't draw feet to draw a huge bare foot front and center on the cover of a comic. Also, I like this rivalry between Boom Boom and Jubilee. I wish it had stuck around. Me too - there's some fun to be had in the two would-be mallrats w/explosive powers sniping at each other. Does Cable know that he’s Scott’s son? I understand that real-world it wasn’t decided he’d be revealed as Nathan Christopher Charles Summers when this was published, but I’m asking whether, retroactively, at this point in his past he maybe had memory blocks or implants or something. Otherwise it’s weird to see him referring to Scott as “Summers” — not that he’d be saying “Dad”, just that “Scott” and “Cyclops” would both seem more appropriate choices given that Summers is his own last name. Although I grant that it’s a situation with precedent and close parallel of how Darth Vader refers to Luke as “Skywalker” to mask the later revelation from fans as well as drive home the dissociation with his old life even after Lucas et al. had settled on Vader being Anakin Skywalker. Are those laser pulses on the cover being shot from Cable’s crotch or at Cable’s crotch? 1) I'm not sure if Cable does or doesn't know if Scott is his dad, but he should be at least noticing that yes, not only does this guy have the same last name as he does, but also funny enough has the same powers as his own foster dad who raised him in the future (who funny enough was Scott mentally inhabiting the body of someone who had the same optic powers because 90's COMICS!). 2) It's a Liefeld cover, so I'm guessing from. I actually read The Adventures of Cyclops and Phoenix, as well as the run of X-Men immediately around it (wedding included), when it came out. My question, however, was less about Cable getting weird vibes if he didn’t know the relation than him referring to Scott as “Summers” if he did because there are ways for Cable to speak to Scott with gruff, all-business unfamiliarity without using their shared last name since that’s a strange thing to do; “Scott” and “Cyclops” and even “Mr. Summers” all make more sense. The point about Cable piecing stuff together assuming he didn’t know Jean and Scott were his parents, in Jean’s case with a definite asterisk but like you say he was partly raised by her in the future, is a good one though, never mind how eerie it would be if he did know, and of course none of this matters overmuch since we're applying knowledge of later plot inventions. No, Cable never knew that Scott was his father or that his "real" last name was Summers until X-Cutioner's Song. Just as an addendum to anonymous' comment, I believe Cable finally learns the truth about his origins (along with the readers) in issues #6-8 of his solo series, which turns out to be the "the real truth behind Cable & Styrfe!" story that "X-Cutioner's Song" was supposed to be. Ah, I was under the impression that since Stryfe knew, Cable would as well. As for Cable referring to Cyclops as Summers, it kind of fits in with Cable's pseudo-military personality. His son would have been "Tyler Summers" then, which would be a name straight out of a soap opera, the no-good representative of the younger generation of the dynasty the show follows, who abuses substances and is always up to shenanigans. Actually, pretty much what we got really. I have never gotten over the fact that the early days of The Bold and the Beautiful had a character named Storm Logan. I seem to remember reading somewhere or getting the impression that some part of the crew started thinking about Cable as Summers, Jr. around the end of New Mutants, when they revealed the Stryfe/Cable connection. According to the below, it was Lee and Portacio that came up with the plan shortly after this though. For somebody who is adverse to drawing feet , ( to the point it becomes an internet joke ) Liefeld shows he can actually draw feet. ...Or maybe the inkers helped him out.